I promised to analyze games that I played during 10th Chess Festival "The Battle of Senta 1697". Well here it is, starting with the game against IM Petar Benkovic played in the 2nd round. I won against Petar once back in 1998, he was only FM then. I was already surprised here. 5... Bb7 7. Nc3 c5 8. e4 cd4 is the line I knew. How to react on c5? 6. e3 is rather passive, 6.dc5 bc5 gives great game for Black and 6. g3 cd4 7. Nd4 Bb7 is unpleasant. 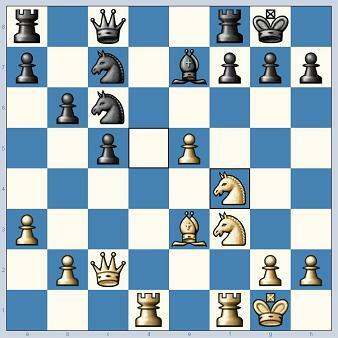 6. d5 was first that came to my mind, it's the only way to fight for the initiative, but I have to give up the pawn. I saw next six moves and I decided to go for it. I was going for position after 11. Nc3. White is pawn down but Black has problems with his development - Qe7 is clumsy (Petar is moving the Q next move) and d-file can become important factor sometimes (he has backward pawn there). After 11... Qd8, playing straightforward 12. Re1 Nc6 13. Nd5 Ne6 14. Bd2 Bd6 15. Bc3 Ncd4 gives nothing to White. Interesting was 12. Be3 Nc6 13. Rfd1 Ne6 14. Be2 Be7 15. Rd2 with doubling Rooks on d-file. Petar told me after the game that 11... Qd8 was new move, 11... Nc6 12. Bg5 f6 13. Nh4 with wild complications was tried earlier. I decided to show my intentions by playing 12. Ng5 instead of 12. Be3. Idea is to play f4 and e5 sometimes and attack either f7 or h7, depending on his castle. 13. f4 was psychologically hard move. 13... Bg5 14. fg5 looks ugly for me, but since Knight is still on b8 (the one that can reach d4 or e5) I get some tempi to attack along the f-file and maybe transfer the Queen to h4. For example 13... Bxg5 14. fxg5 Nc6 15. Bf4 Ne6 16. Bd6 Qxg5 (16... Nxg5 17. Nd5 Ne6 18. Qf2 f6 19. Be2) 17. Bc4 (17. Qf2 f6 18. Nd5 Kf7) 17... f6. 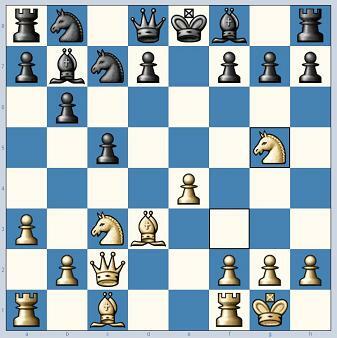 After his 13... Nc6 I already have to bring my Knight back to f3 because Nc6 has nasty jumps on the next move. But I was also happy with Ng5-f4-Nf3 because now I have mobile pawns for e5 or f5. After Rad1 I am already better. All of my pieces are developed and ready for action while his King is still in the center. I was very pleased at this moment :-) If 16... O-O 17. e5 or 16... Qe6 17. Rfe1 O-O 18. Nd5 Rac8 19. Nxe7+ Qxe7 20. e5. 16... Ba6 admits that Black has lost theoretical duel (although I was out of book on 6th move). Petar was ready to give pawn back, reduce some of the pressure and fight in a weaker position but with less pieces on the board. Now I believe that best way was 17. Qa4 b5 (17... Bb7 18. Nd5 O-O 19. Qxc6 Bxc6 20. Nxe7+) 18. Nxb5 Bxb5 19. Bxb5 Nxb5 20. Qxb5 trading couple of pieces but with huge positional advantage. But psychologically, it is very hard for the player that has strong attack (me) to switch to the pieces trade and play on a weak backward pawn :-) My blade was sharpened and I wanted to continue with the attack. Better was 18. Nd5 O-O (18... Nc7 19. 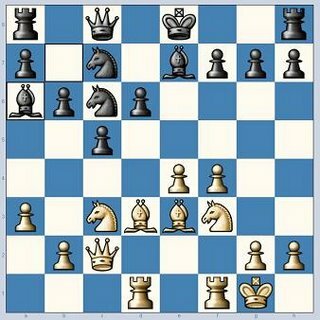 Nxe7 Nxe7 (19... Kxe7 20. e5) 20. Rxd6) 19. Nxe7+ (19. f5) 19... Nxe7 20. Rxd6 and I still keep the big advantage. Now I started to lose my strings and soon everything went downhill. My next 4 moves where all mistakes. Even though position is still very playable, I was lost here. Having dropped huge advantage, I can't stop making mistakes. Best was 21. Nxe7+ Nxe7 22. Ng5 Ng6 but I still have some illusions about the attack and don't want to trade more pieces. Petar's Knight is now reaching dominant e6 square (defending everything) and slowly he started to improve his pieces. Remember? His biggest minus was development and bad placed pieces.